EPDM roofing is an excellent option for any flat roof! Call the Roofworx contractors at 817-920-5974 to learn more about our commercial roofing options and how we can be of service. We install and repair EPDM roofing in Fort Worth, TX and Dallas, TX. In use for several decades, EPDM (ethylene propylene diene monomer) roofing is a reliable single-ply membrane used primarily on flat commercial roofs. It is a synthetic rubber with excellent waterproofing capabilities and weather resistance. 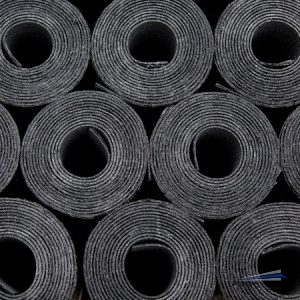 In addition to roofing, you have likely seen EPDM rubber used in vehicles for door seals and hoses. Most often found in black, EPDM roofing comes in large rolls that can be attached to your roof mechanically, fully adhered, or ballasted. This gives you a variety of options when it comes to replacing or installing EPDM roofing. Although black EPDM is not energy efficient, white EPDM has become available in recent years. Dark roofs absorb heat from the sun, increasing your building temperature and driving up energy costs. In a state like Texas, this can be a serious disadvantage, especially if you have a very large roof. However, if you want efficiency, you do not have to forgo a black EPDM roof system. If you are concerned about your building’s energy efficiency, you can also install a reflective roof coating over your EPDM roof. Not only will this reduce the temperature of your roof, it can also add 10+ years to its lifespan. One of the major benefits of EPDM is its durability, as it tends to last 25-30 years or more with proper care. It also stands up well against thermal shock and hail. When you need a quality rubber roof, choose Roofworx for all your commercial roofing needs! Our skilled contractors ensure proper installation and repair so you get a durable, leak-free roof system. To learn more about EPDM roofing in Fort Worth, TX and Dallas, TX, contact the commercial roofing experts at Roofworx at 817-920-5974! Updated on March 28, 2017 at 7:18 pm by Roofworx & General Contracting.